Ingredients: Sulfate Free Surfactants, Whitening, Brightening Agent, Polymers, Natural Enzyme, Coconut Fatty Acid, Glycerin, Citric Acid, Protectant/Preservative, Fragrance, Purified Water. Thanks to Smiley 360 and the All brand is had the opportunity to try the new All Fresh Clean Essentials Sulfate Free Laundry detergent for free in exchange for my opinion. Great right!! I tell you my Smiley kit came right in time for me to do a couple of loads of laundry mainly my children's clothes. It was a great way to put the new detergent to use to see just how well it worked. I noticed that the detergent was thicker than most. After the wash it noticed that it left the clothes with a fresh clean smell. I will definitely be buying this product more often. I couldn't wait to tell my friends and family about this amazing product. Thanks for the amazing opportunity to try this awesome product. I received a free sample from smiley360.com of All Fresh Clean Essentials Fresh Scent Sulfate Free Detergent. I loved that it is 100% Dye and Sulfate free it cleaned my clothes very well and smells nice too! I Also liked that it is good on sensitive skin because some of family have it and glad I don't need to worry about it. I received a free product for the purpose of my review. Opinions are 100% my own." Fresh Scent, Great Clean, Safe for All! (Disclaimer: I received this item for free from All via Smiley360 in exchange for my honest review!) When it comes to cleaning aids, I think there is a tendency to think that the best cleaning products are the ones laden with chemicals. Oh, you don't think that? Well, I definitely did. While I like using more natural, chemical-free products, it seems like cleaning supplies are where that stops, including my laundry detergent. I don't like sulfates in my hair products, so why am I okay with them in my clothing care? All Fresh Clean Essentials Sulfate Free Laundry Detergent is sulfate free and dye free, delivering a powerful clean without the harshness. It is HE compatible and contains purified water to incorporate the ingredients together. Everything is easy to pronounce and easy to identify. I like that. And because it is free of dyes and sulfates, it's safe for laundering baby's clothes as well. Now, I admit - I was wondering if it would clean as well as my store brand laundry detergent. I also wondered if the scent would stay on the clothing or if it would fade away. Well, Thursday is laundry day and so I got to put it to the test. The first thing I noticed was the smell. It smelled GREAT! It poured easily as well. Once my clothes were done washing, they smelled great as I transferred them from the washing machine to the dryer. My clothes were clean, smelled great, and were washed well. What more could I ask for? This fresh scent is the best! And ALL delivered a powerful clean to remove the dirt and stain from my clothing. I found that sulfates aren't needed to provide a good launder. Dyes definitely aren't needed, other than for looks. You can a great wash, if not better, with All Fresh Clean Essentials Sulfate Free Laundry Detergent. I would definitely purchase again. If you're looking to remove stains from whites, you'll definitely want to use a bleach to do so. ** I received a free sample of this product of this product through Smiley360, in return for my honest review. All opinions are my own. ** I am very pleased with this detergent, especially the scent! I have been buying laundry products for over 3 decades now, and I can't remember being this thrilled to do laundry before! It smells lovely and actually is, fresh and clean! It isn't overpowering however, if you don't care for super string scents, just keep in mind that it isn't as strong as when you just smell it straight from the bottle. I am hoping for a bigger bottle someday but until then, I will continue to order a few at a time. I have been buying this since receiving a free sample and go through at least one bottle a week. I would also love to see other scent options in the future! But, for now, I am super happy with this scent. Yes, it actually works! Everything comes out nice and clean and soft. Being sulfate free, it is better for your clothing, sheets, and towels too! You will still need another product for hard to treat stains but, that's the norm with most detergents anyway. I have had luck with some not so brutal stains, pre treating and washing with just All Fresh Clean Essentials. (Chocolate, light grass stains, and pizza sauce.) (Yes, 4 kids!) 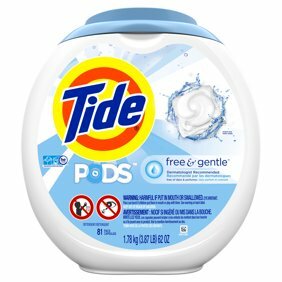 I like the price, the scent, how well this gets our laundry clean, and I really love how long lasting the scent is! I keep washing sheets and blankets, more than normal, because of this!